Port Hope’s well-documented history comes to life in the Library’s Local History Collection. The story of Port Hope, Hope Township and the surrounding area is a one vividly told through books, newspapers dating back to 1832, family histories and census records. Our resources can help you find out about the history of the area and the families who lived here through the years. The Library’s collection is complemented by the material held at the Port Hope Archives. The Library’s local history and genealogy resources are highly-valued research tools. To ensure their availability for all patrons and visitors these materials are for reference use in the Library only. Port Hope Public Library Listing of Newspapers on Microfilm lists holdings in the Library's microfilmed newspaper collection generously sponsored by the Wladyka Family, Happytown Productions, the Becker family, Northumberland Today and the Ontario Ministry of Culture. Original copies of local newspaper issues are held for approximately six months, until the microfilm copy is available. Our excellent genealogy volunteers are working on indexing the microfilmed newspaper collection. Births, deaths, and marriage indices available online at www.alivingpast.ca/. The Library offers interlibrary loan services for material from the provincial and national archives, subject to the lending rules of those institutions. If you have roots in the Port Hope area and are interested in researching your family tree, have a look at these online resources. OnLand, a Service Ontario database which provides access to digitized copies of the land abstracts books –a great way for you to access historical land information from home. The quality of digitization for some books is poor making reading entries an issue so please be aware of the database limitations. If you find you require some research assistance in either starting a project or perhaps find yourself at an impass with your family history our wonderful volunteer, Peter Bolton, can be found in the Local History Room (second floor Mary J. Benson Branch) on Monday mornings. Peter will be on hand from 10 a.m. to noon to lend an extremely experienced and knowledgeable hand with your reseach dilemmas. The website Peter developed www.alivingpast.ca is a great resource for local history and genealogy research. Due to a varied schedule please confirm that Peter is available in the Branch on a Monday by calling 905-885-4712. 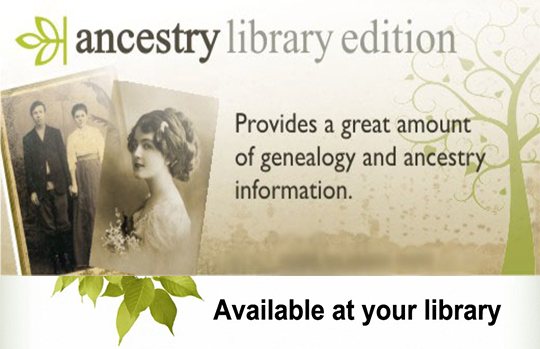 Ancestry Library Edition is a genealogy resource available to the public in-library only on our public Internet workstations.